Punch holder pouch with strap. 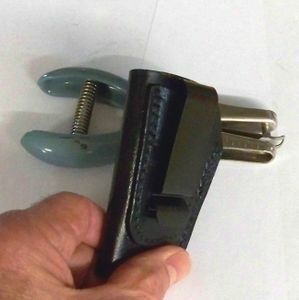 Holds ticket punch for bus drivers and conductors. Slides on belt to hold punch horizontally (5860-1 and 5860-3). Can also hold many kinds of pliers and similar tools of the same size. Has retention strap with snap. Vertical Punch Holder #5859-1. Same size, just with a vertical orientation. Can accommodate 2 inch belt. Also available is the open top punch holster with metal clip #5862-1. The clip will accommodate belts up to 2 inches wide. The 5862 is shown in the last picture and is an open top sheath with a clip to attach to your belt. Note: Larger quantities will require 10 to 30 day lead time.